A few weeks ago, I went to the Museum of Natural History in Halifax, Nova Scotia, not too far from the rural area in which I live, to see the much-hyped (and also quite excellent) display of the giant T. rex, Sue, on loan from the Field Museum in Chicago. After thoroughly exploring dinosaurs, I set off to tour around the rest of the rather small museum. Despite its small size, the museum has a lovely collection of Victorian glass specimen jars (and others of more recent vintage) filled with wonderful sea things--though they have other collections, it's the sea that occupies most of it, since Halifax is a coastal city. And among those jars and mounted skeletons of assorted whales, I found the prettiest delicate shell (I wanted to write "little shell", but it's not really so small). This is a cephalopod, like the squid and octopus, but rare. Female Argonauts make the beautiful, paper-thin shell to hold their eggs. About 80 years ago, Museum Curator Harry Piers collected live ones in Yarmouth Harbour--an amazing find for these tropical creatures. Only a few empty shells have turned up since. There's also a map showing the argonaut's range and the location of Nova Scotia (apologies for the photograph--I should know better than to go to a museum armed only with my iPhone camera). 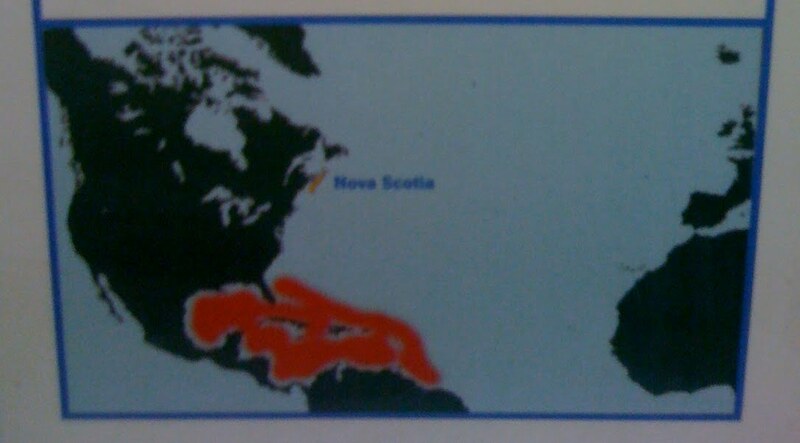 Discovering this made me want to do two things: head south to Yarmouth to scour the beaches for argonaut shells (I'm located smack in the middle of NS, but a day trip to Yarmouth isn't out of the question in the summer), and do some research to find out more about this lovely cephalopod. As it turns out, the argonaut isn't just "like" the octopus, it is an octopus. It's a small, pelagic (that is, open-ocean-dwelling) octopus that, unlike any other octopus families, secretes an eggcase. The largest male argonauts are only about 2 cm (that's not quite an inch) in size, while females can be up to 10 cm (about 4 inches). Eggcases--which are not true shells like that of the nautilus (which was named after the argonaut due to the similarity of their shells)--can be up to 30 cm (almost 12 inches) and are made of calcite. Though the primary function of the argonaut "shell" is to hold eggs, the female remains with it, and will shelter inside inside it. There are 7 to 11 living species of argonaut (the species status of some is disputed), and a number of extinct species. Unlike most octopuses, which live on the sea floor, argonauts are near-surface-dwelling creatures. And, also unlike many other octopus species, argonaut females can have offspring many times over their lives. Argonauts (the egg-case-secreting females, anyway) have been known since the 19th century, when they were believed to use their shells like boats and their arms like sails. They make an appearance in Jules Verne's 20,000 Leagues Under the Sea, and some editions have a illustration of the little octopuses surrounding the Nautilus, arms raised as they sail by. 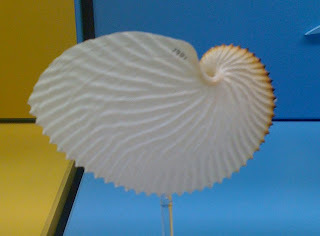 The Argonauta argo shell I saw at the museum is a representative of the largest species of argonaut. Apparently these are the shells that can be almost a foot long. The one I saw was perhaps 4 inches at its largest dimension. It's simple and elegant (other species secrete more elaborate shells), and even though argonauts don't really sail with their arms, the image of little octopuses bobbling near the surface in their pretty little boats fills me with glee. I will certainly be looking out for more information, and don't be surprised if they turn up in my art at some point. Popping in to share this brilliant work of art I just was lucky enough to acquire. 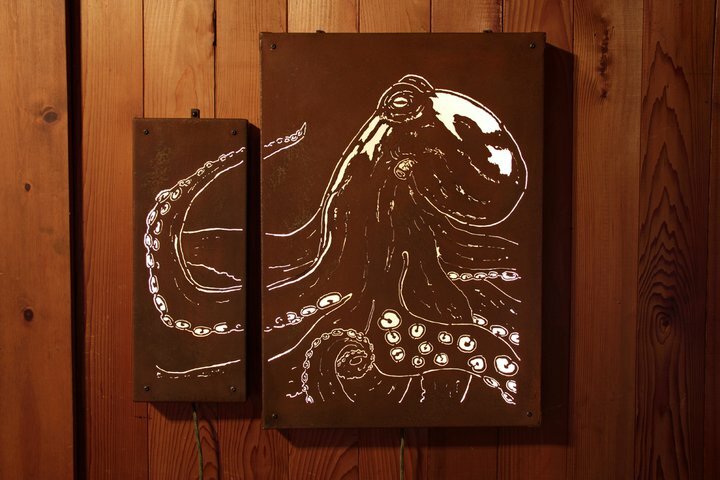 Yes, it's a two-piece rusted iron light box with an octopus carved in it by my friend Todd Barricklow. 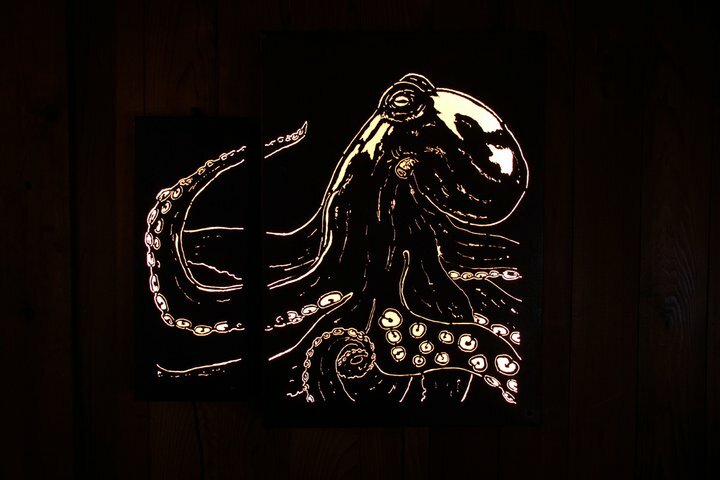 Sorry, cephalopod fans, it's one of a kind. Do check out Todd's work on his website - besides making amazing light boxes, he's a wonderful ceramacist, as well as a builder of contraptions for the Handcar Regatta. Todd is also the creator of the famous Taco Bike, which you may see out and about if you live in the San Francisco Bay Area.